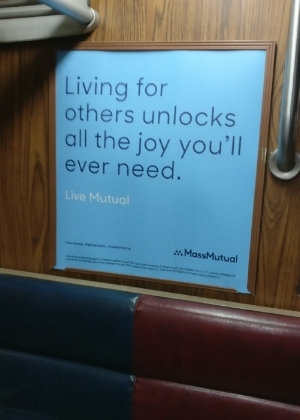 I saw this poster on the commuter rail to Boston the other week, and started wondering what would make it a more effective advertisement for someone like me. If a company wanted to be powerfully associated with things like joy, love and community, what might their Gift of Happiness-inspired advertising campaign look like? What do you think? Would an advertising campaign like that catch your eye? Do you know companies that already advertise that way? What other creative ideas do you have for companies that want to make a significant positive difference in society?